Roseau: Hurricane Maria smashed into Dominica with 160 metres per hour winds, ripping the roof off even the prime minister's residence and causing what he called "mind-boggling" devastation Tuesday as it plunged into a Caribbean region already ravaged by Hurricane Irma. The storm was on a track to wallop Puerto Rico on Wednesday "with a force and violence that we haven't seen for several generations," the territory's governor said. Dominica Prime Minister Roosevelt Skerrit said on his Facebook page that "initial reports are of widespread devastation" and said he feared there would be deaths due to rain-fed landslides. He said even his own house had lost its roof, adding "I am at the complete mercy of the hurricane. House is flooding." Seven minutes later, he reported he had been rescued. Maria's eye roared over the island late Monday night. 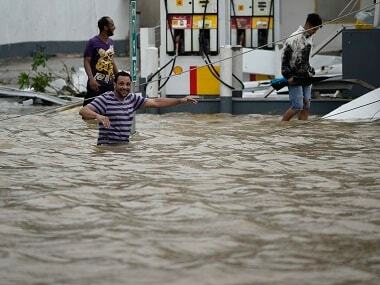 The storm briefly dipped to Category 4 strength early Tuesday before regaining Category 5 status. "Where we are, we can't move," he said in a brief phone interview while hunkered down against the region's second Category 5 hurricane this month. "The winds are merciless! We shall survive by the grace of God," Skerrit wrote at the start of a series of increasingly harrowing posts on Facebook. He then wrote that he thought his home had been damaged, and added: "Rough! Rough! Rough!" Prefect Eric Maire, the highest French official of Guadaloupe, said in a video on Twitter that some roads and homes were flooded and heavy rain expected to continue. He told the population to "remain inside." 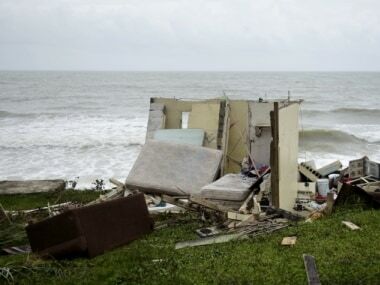 Authorities in the US territory of Puerto Rico, which faced the possibility of a direct hit, warned that people in wooden or flimsy homes should find safe shelter before the storm's expected arrival there on Wednesday. 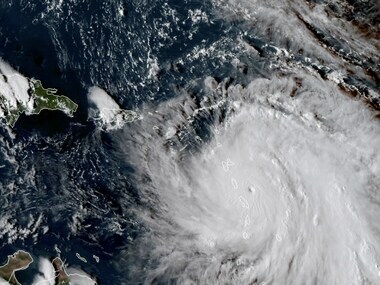 The US National Hurricane Center said Maria weakened briefly before recovering sustained winds of 160 mph (260 kph) strength shortly before daybreak Tuesday. Its eye was located about 170 miles (275 kilometers) southeast of St. Croix, and the storm was moving west-northwest over the Caribbean at 9 mph (15 kph). Forecasters warned Maria could even intensify over the next 24 hours or longer, noting its eye had shrunk to a compact 10 miles across and warning: "Maria is developing the dreaded pinhole eye." "You just don't see those in weaker hurricanes," he said. The storm's hurricane-force winds extended out about 35 miles (45 kilometers) and tropical storm-force winds out as far as 125 miles (205 kilometers). Forecasters said storm surge could raise water levels by 6 to 9 feet (1.8 to 2.7 meters) near the storm's center. The storm was predicted to bring 10 to 15 inches (25 to 38 centimeters) of rain across the islands, with more in isolated areas. 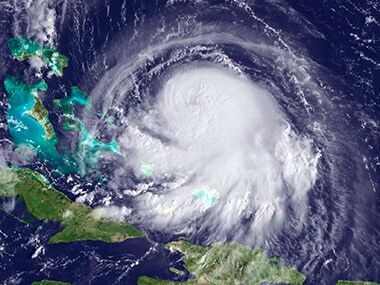 Close to its path is the island of St. Croix in the U.S. Virgin Islands, where territorial Gov. Kenneth Mapp said Tuesday would be "a very, very long night." Barry University said it chartered a private plane to carry students and staff from its St. Croix facility to Florida in preparation for Maria. It said 72 people connected to the Barry's Physician Assistant Program and a few pets were on Monday's evacuation flight. "This is going to impact all of Puerto Rico with a force and violence that we haven't seen for several generations," he said. "We're going to lose a lot of infrastructure in Puerto Rico. We're going to have to rebuild." Rossello warned that an island-wide power outage could last a "long time" given the power company's deteriorated and weak infrastructure. Jose's center was about 350 miles (560 kilometers) south-southwest of Nantucket, Massachusetts, early Tuesday and moving north at 9 mph (15 kph). The storm had maximum sustained winds of 75 mph (120 kph).